Big news from Mazda today: 900,000 Miatas have been built. 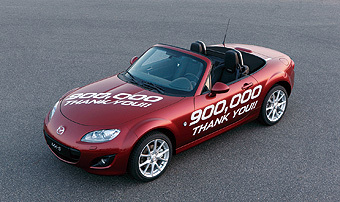 HIROSHIMA, Japan—Total production of Mazda Motor Corporation’s MX-5 sports car (known as the Mazda Roadster in Japan) reached 900,000 units on February 4, 2011. This significant milestone was achieved 21 years and 10 months after mass production of the first-generation MX-5 commenced in April 1989. The MX-5 was initially certified by Guinness World Records as the world’s “Best selling two-seat sports car” when production reached 531,890 units in May 2000. Guinness updated the record when production passed 700,000 and, later, 800,000 units. Currently, Mazda is reapplying to Guinness World Records to have the record updated to 900,000 units. During the 1960s and 1970s, numerous lightweight and fun-to-drive sports cars offered nimble handling and free-spirited open-air motoring. In the 1980s, Mazda decided to resurrect this spirit with a new roadster for the modern age. Using the latest engineering techniques, Mazda developed the MX-5 and announced it in February 1989 as a reminder that driving could still be fun despite ever-stricter safety and quality standards. To this day, the MX-5 remains the longest enduring nameplate in Mazda’s global lineup.